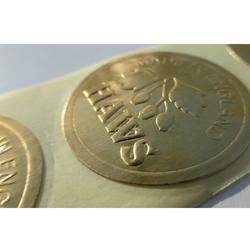 With the help of male/female die tools embossed labels can produce.Either on any metal like Aluminium, Brass Stainless Steel, copper, or silver. In this type quantity is required. 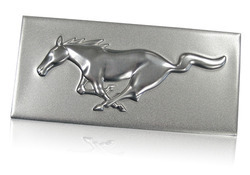 We are among the acclaimed names in the industry for manufacturing and exporting Aluminum Embossed Labels. Our organization is among the leading names in the industry for manufacturing and trading Embossed Labels. Offered by us a wide range of Embossed Labels that is manufactured using high grade raw material by our expert professionals. The entire range is available in any desired images, letters or numbers. Moreover, our quality analyst checks the products in various parameters in order to offer the labels as per defined industrial standards. This gives glossy look, which is different to standard printed labels. Generally black satin or taffeta with gold foil gives rich look to the product. We are an authentic manufacturer and supplier of Embossed Labels that are quality driven and have attractive looks. We have gained vast expertise in offering a extensive range of Embossed Labels that are appreciated for their superior quality and durability. Our company is counted amidst the most trustworthy Embossed Labels Manufacturers in India. The Foil Embossed Labels are considered ideal as these depict a 3D effect of the label. Customers are eased with the availability of the customized logo, name and information on the Custom Printed Embossed Labels at the most reasonable prices. Driven by vision to achieve significant growth in the industry, we are engaged in manufacturing a wide range of Printed Embossed Label.